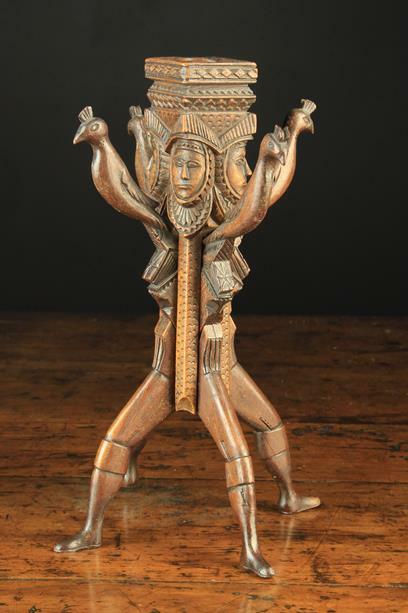 A 19th Century Carved Treen Puzzle Candlestick made up of five components slotting together to form a cruciform stand with human legs wearing breeches and boots, surmounted by crested birds. The quadriform core chip carved with face masks below the candle socket, 10 in (25 cm) high. 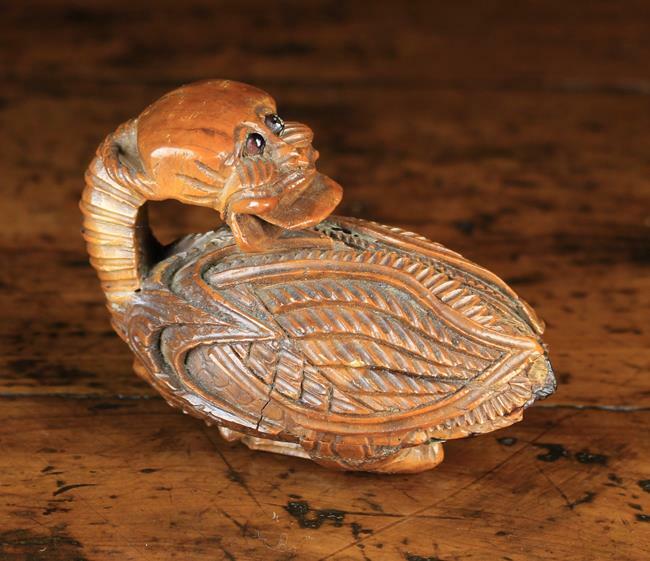 A Treen Loving Spoon, 20th Century, carved with two caged balls to the shank and a padlock threaded onto an open link chain with key to the handle, 20 in (51 cm) in length. An Early 19th Century French Coquilla Nut Snuff Box elaborately carved with the folklore figure of a winged Tarasque with long ribbed neck and inset bead eyes, 2¾ in (7 cm) high, 4 in (10 cm) in length, 2 in (5 cm) wide. An 18th Century Steel Revolving Plate Warmer with a ring holder on three upswept arms above a baluster stem with brass discoid collar and tripod base on pad feet. 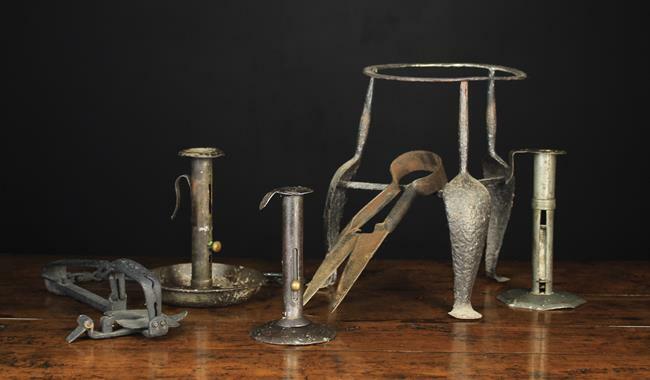 An 18th Century Wrought Iron Hearth Toaster. 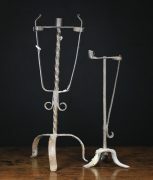 The decorative handle pierced with a heart and a trefoil finial, 19 in (48 cm) in length. 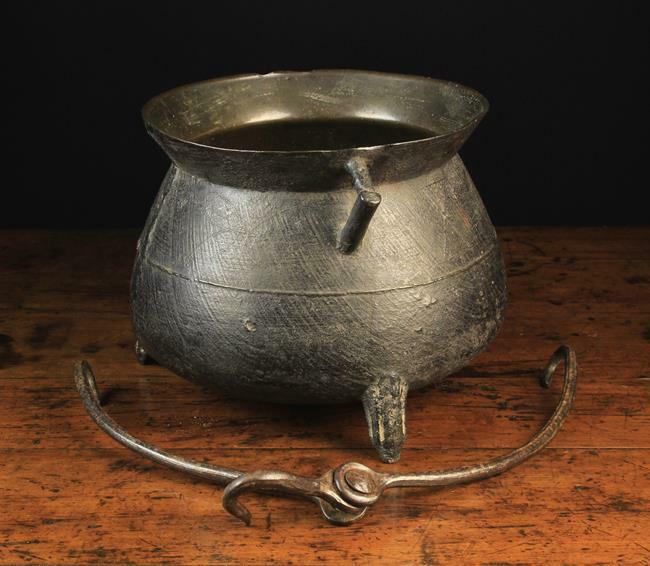 A 17th Century Somerset Cast Iron Cauldron with John Fathers I's scratch mark alongside the quatrefoil mark of the Sturton family. Having triangular lug handles and three reeded legs, 9 ins (23 cm) high, the rim 10¼ ins (26 cm) in diameter. Along with a hinged suspension hook. 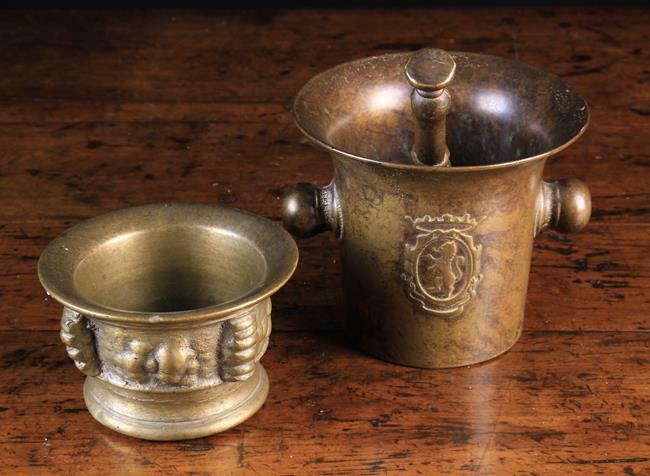 An 18th Century Bronze Pestle & Mortar with flared rim, armorial medallion to the sides and protuberant knop handles, 4¾ ins (12 cm) in height, and a small 17th century cast bronze mortar 2¾ ins (7 cm) high, 4½ ins (11 cm) in diameter. An Unusual Early 19th Century French Brass Pendant Oil Lamp. The wrythen hook & spike topped suspension bar bearing a small spherical brass reservoir with adjustable wick spout to the side; the nozzle stamped Sardon Bte. 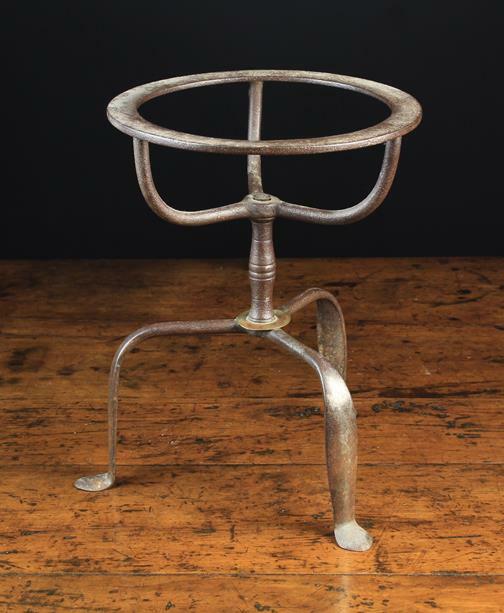 An 18th Century Wrought Iron Trivet with ring top raised on three stems above cabriole sheet iron legs with pad feet, 11½ in (29 cm) high, 8¼ in (21 cm )in diameter, three 19th century sheet metal candlesticks with sliding height adjusters, 8 in (20 cm), 7 in (18 cm) and 6½ in (16.5 cm) in height, an iron snare with sprung jaws, and a pair of shears. 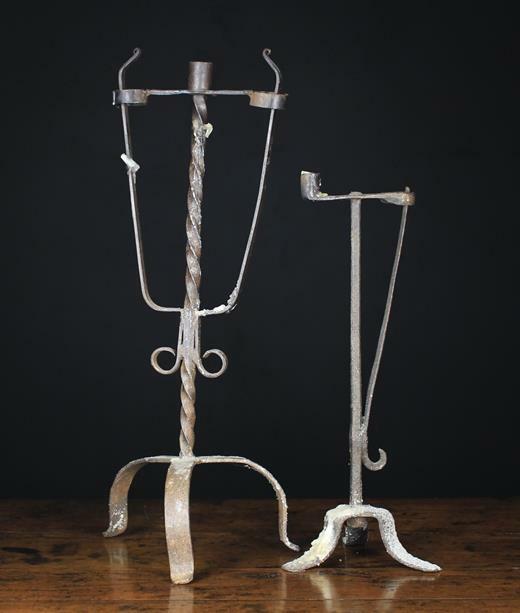 Two 18th Century Style Wrought Iron Peermen with Candle sockets: One having two sprung rush holders flanking a central candle socket on a wrythen stem and tripod base 24 in (61 cm) high. The other 18½ in (47 cm) high.